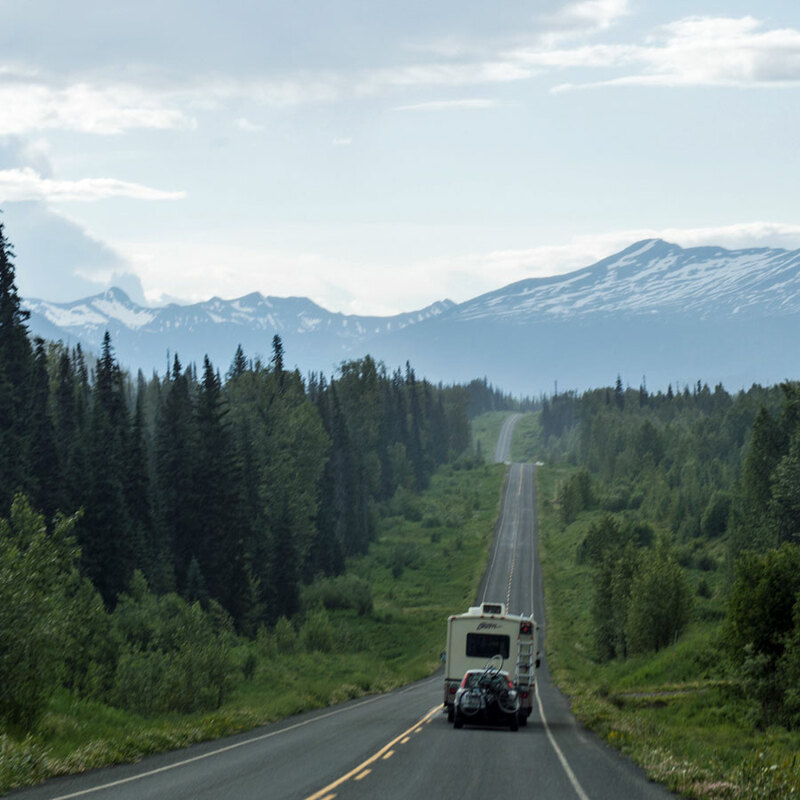 From June 11th to 18th, we caravaned with Beth and Taylor of The Learning Banks from Ferndale, Washington to Fairbanks, Alaska, a more than 2,000 mile-long journey. And we do mean long. It would have been as many miles to drive from Seattle to Chicago. Our journey required some preparation, and we learned a lot more on the way, something we have reflected on to benefit others considering this trek in the future. Here are the details of our own trip. We started our day boondocking in the parking lot of the Silver Reef Casino in Ferndale, Washington, just a few miles from the Canadian border. 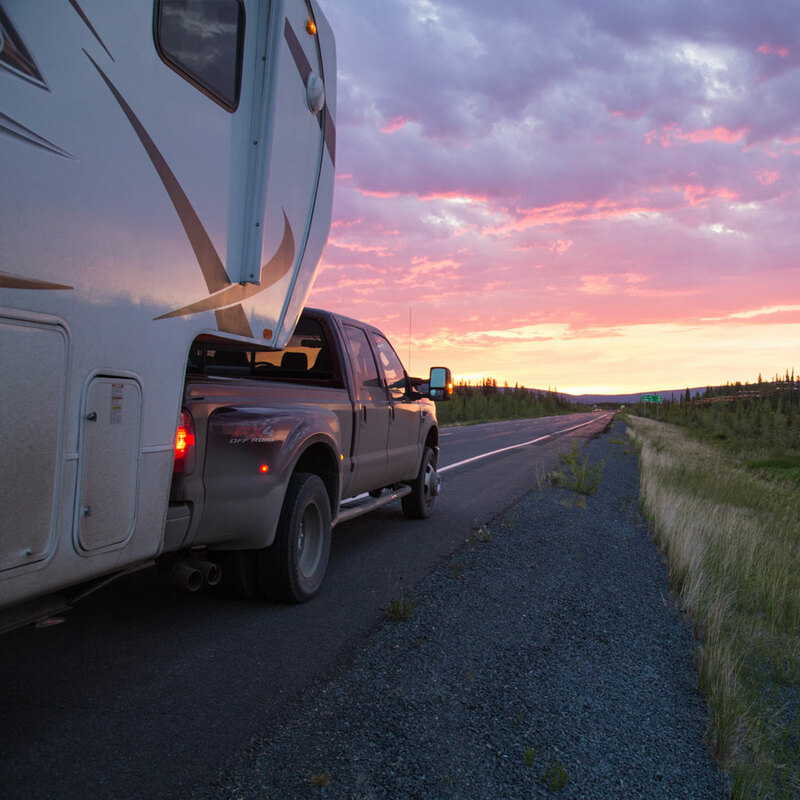 Many casinos offer free overnight parking to RVers in the hopes that they will come inside and dine or gamble. We packed up camp and headed for the border crossing at Lynden, Washington. We hoped it would be a quieter and quicker experience than the larger crossing at Blaine. 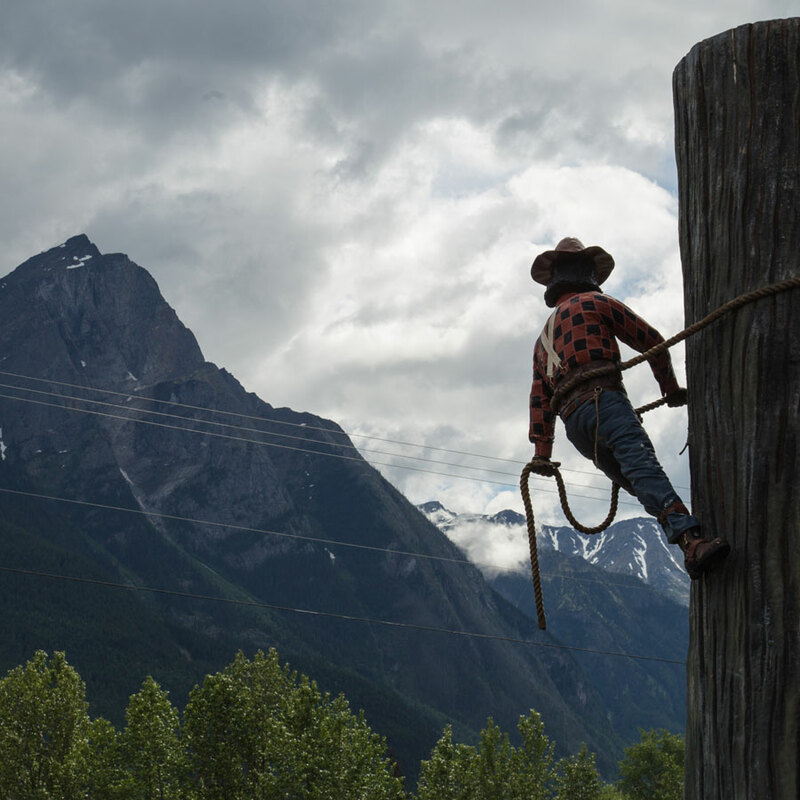 Although our Canadian border crossing agent was all-business, the process was smooth. After a 15 minute wait in line, we showed our passports, were asked if we had any prohibited items, and then told to head on through. The entire process took no more than 25 minutes. Suddenly, we were in Canada, greeted by kilometre-per-hour speed limits, maple leaf flags and cute farms. 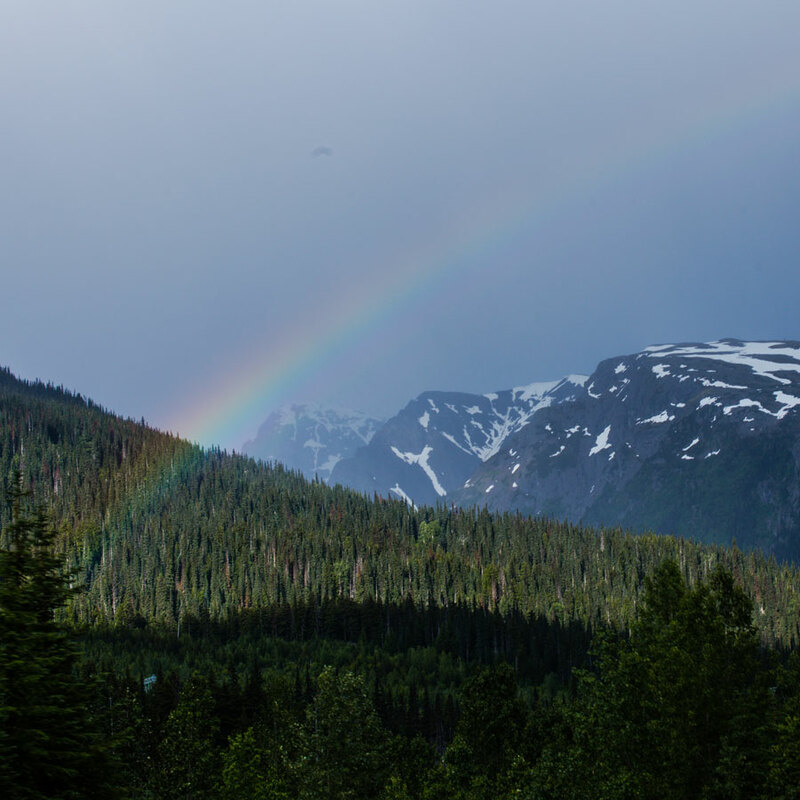 We made our way through country roads to Highway 1, part of the Trans-Canada Highway, then followed the highway north at Hope to drive through the gorgeous Fraser Canyon. The roads were in excellent condition, and the signage was great. Our path took us through seven tunnels, on bridges overlooking rapids and along a historic rail line. 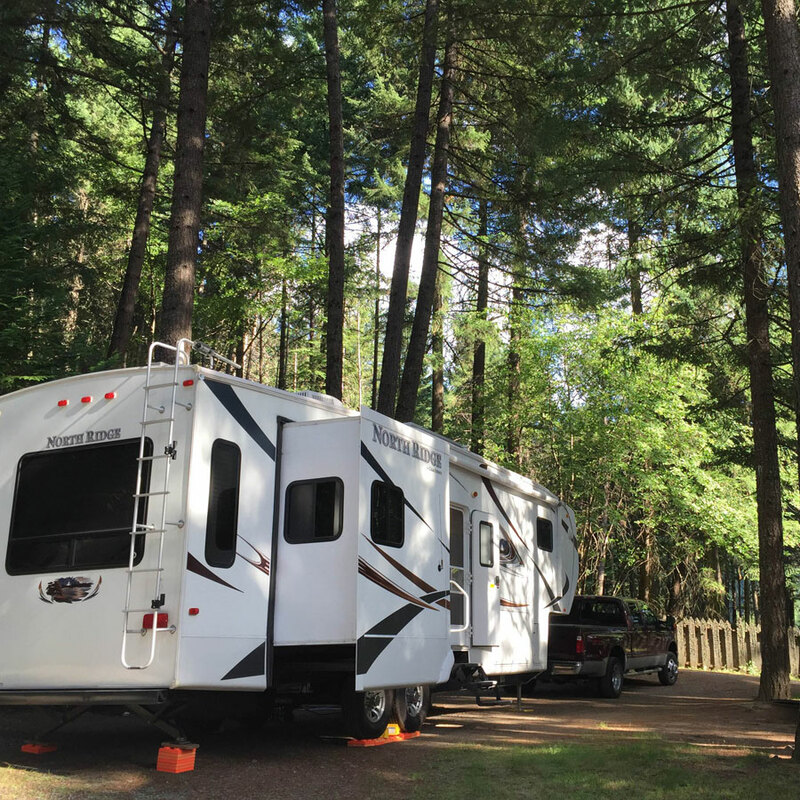 We spent our first night at Canyon Alpine RV Park, a full-hookup park tucked off the highway with an adjoining motel and restaurant where we found dinner. Just a few hours later, Beth and Taylor caught up, having had a longer experience at customs. Before we started our journey, we headed back to the Canyon Alpine restaurant for breakfast and route-planning with the Banks. While we ate, we watched an astonishing number of hummingbirds visit the feeders outside. Then we were off, continuing north along Highway 1 until Cache Creek, were we switched to the Cariboo Highway, part of Highway 97. 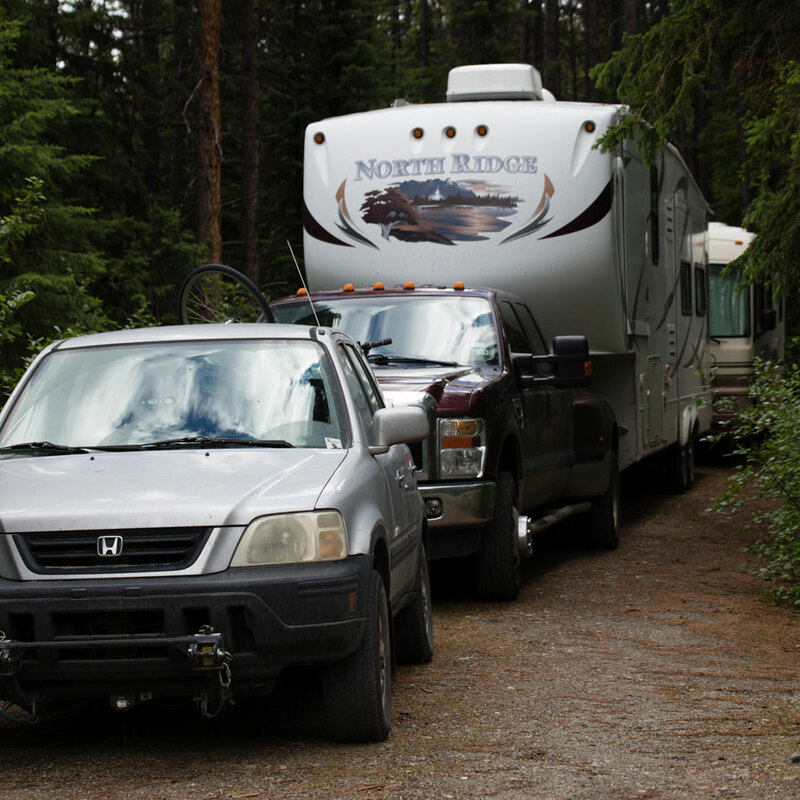 We arrived at Prince George and spent another night boondocking in a parking lot, this time at Treasure Cove Casino. Despite Prince George's size (population 72,000), very few restaurants were open when we arrived; fortunately, the local Boston Pizza chain accommodated our late-night hunger. Our morning proved to be a slow one, deliberating over routes, stopping at Costco for some food and supplies (not least of which included lots of bug spray in preparation for Alaska's legendary mosquitos), and searching for diesel and air compressors that could accommodate our high-PSI tires. 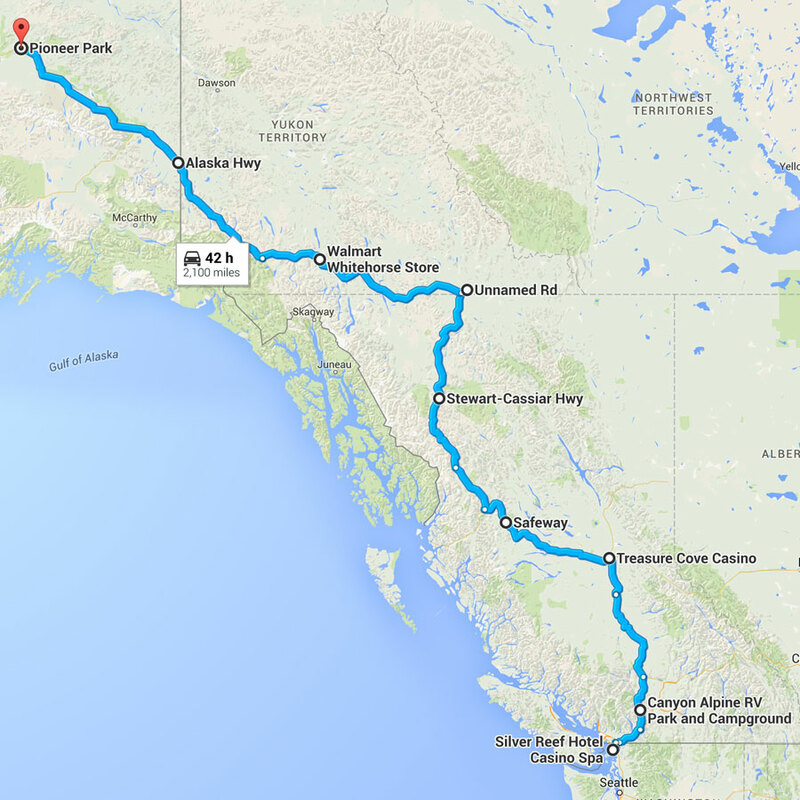 We had two options of directions to take from Prince George: through Dawson Creek or up the Cassiar Highway. 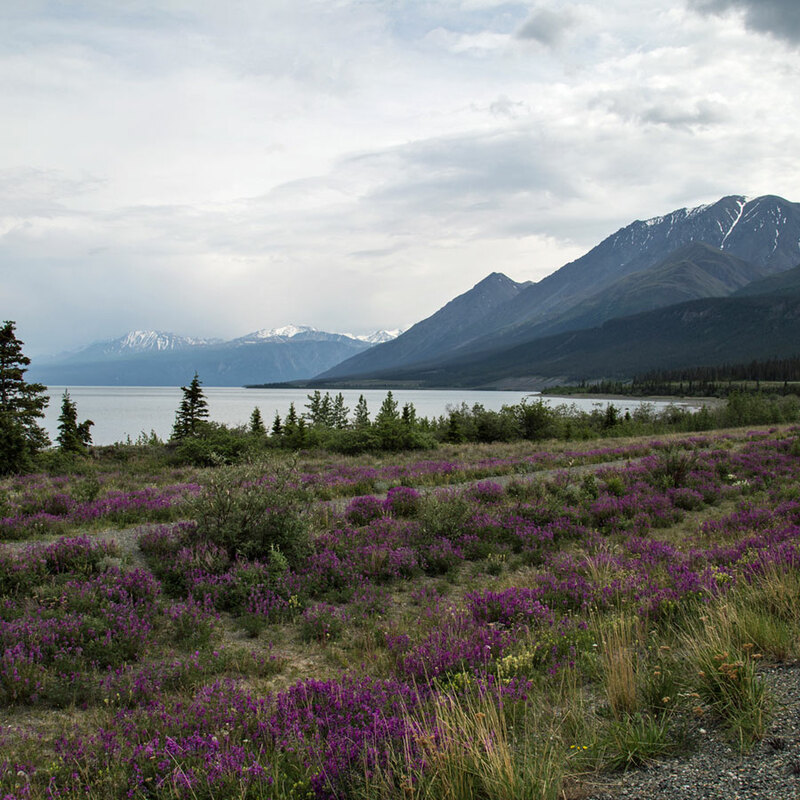 The eastern route is longer but has more traveler amenities and is a bigger highway; the western route is shorter and windier but prettier and with fewer places to stop and gas up. 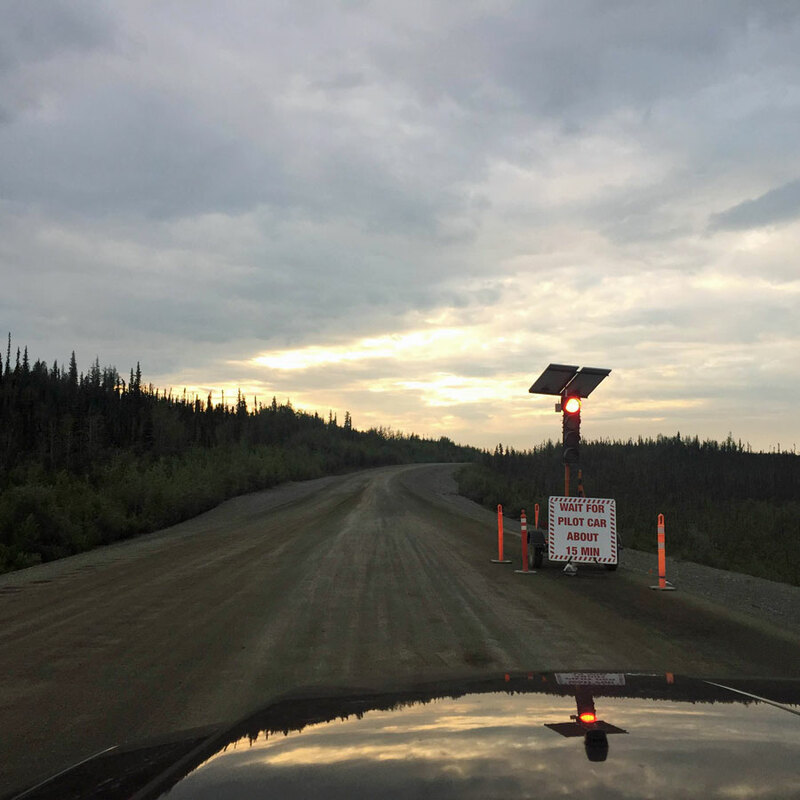 The clencher for us was road grade; around Dawson Creek are several 10% climbs and descents, which sounded pretty steep for our heavy rigs. Plus, we new the Snowmads and Tales from the Mutiny had just gone the Cassiar route and been fine. Shortly we were off, and the views didn't take long to start to impress us. 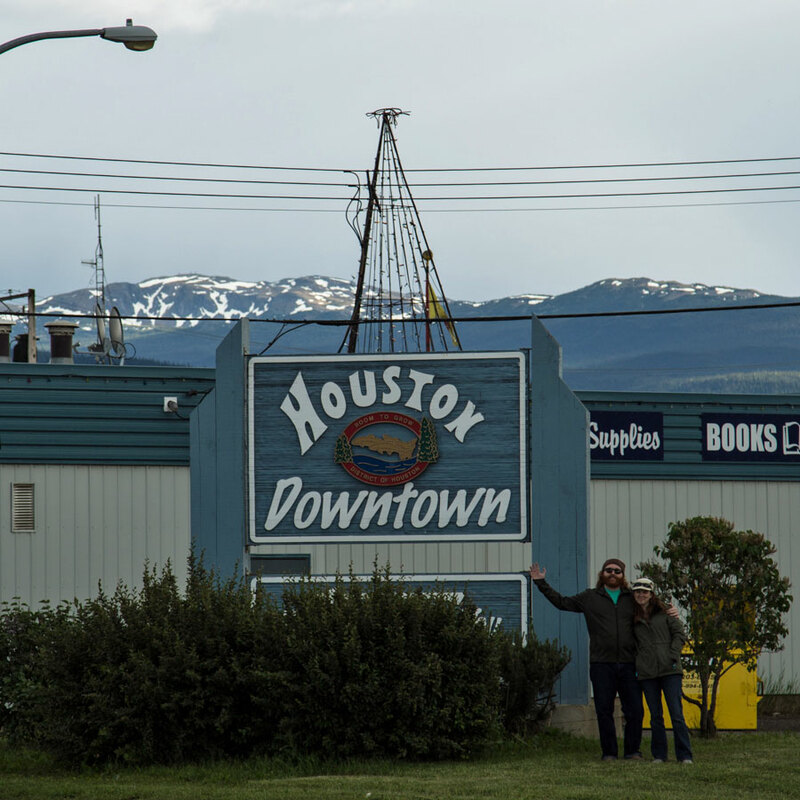 We took a quick break in Houston, British Columbia in honor of the Texan city by the same name that we had left to go full-timing. 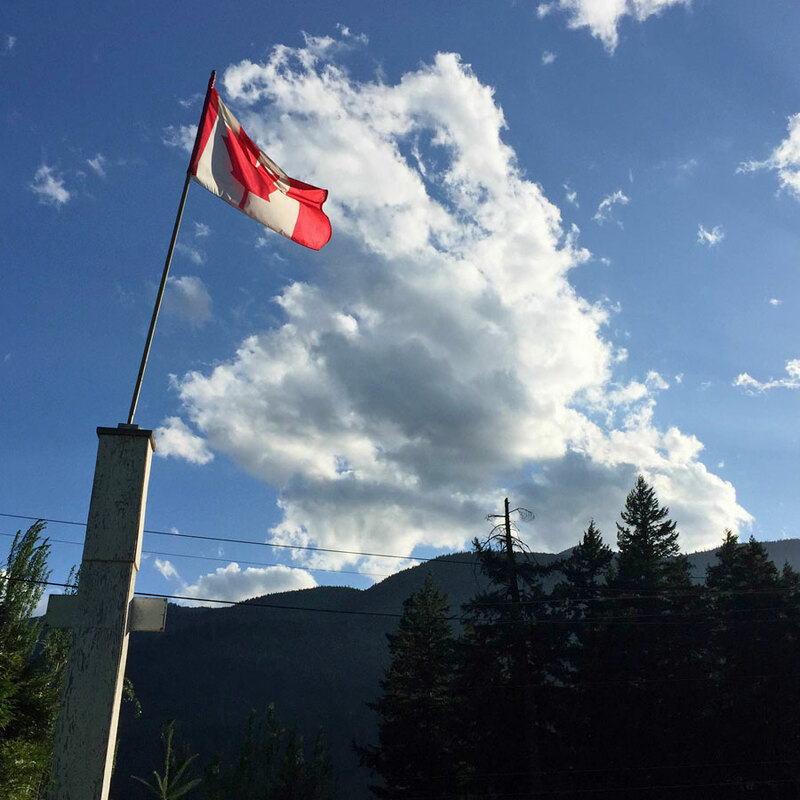 Our home for the evening was the parking lot of a Safeway in the cute town of Smithers, where we enjoyed a delicious dinner featuring our very first poutine (fries with gravy and cheese curds that are way yummier than they sound) at Hudson Bay Lodge. 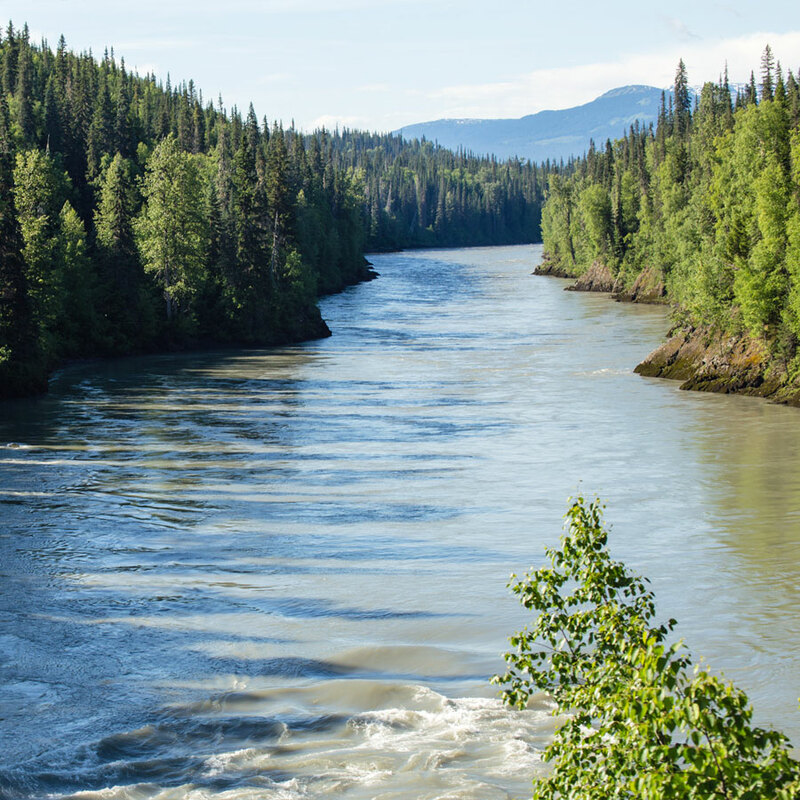 Despite our trepidation about taking the Cassiar route, this day proved my favorite of the trip. We stopped before long at the Hazelton Area Visitor Center, where we took care of business at the free dump station and water fill. It was also the site of a tiny farmer's market, so we enjoyed milkshakes and mountain views. 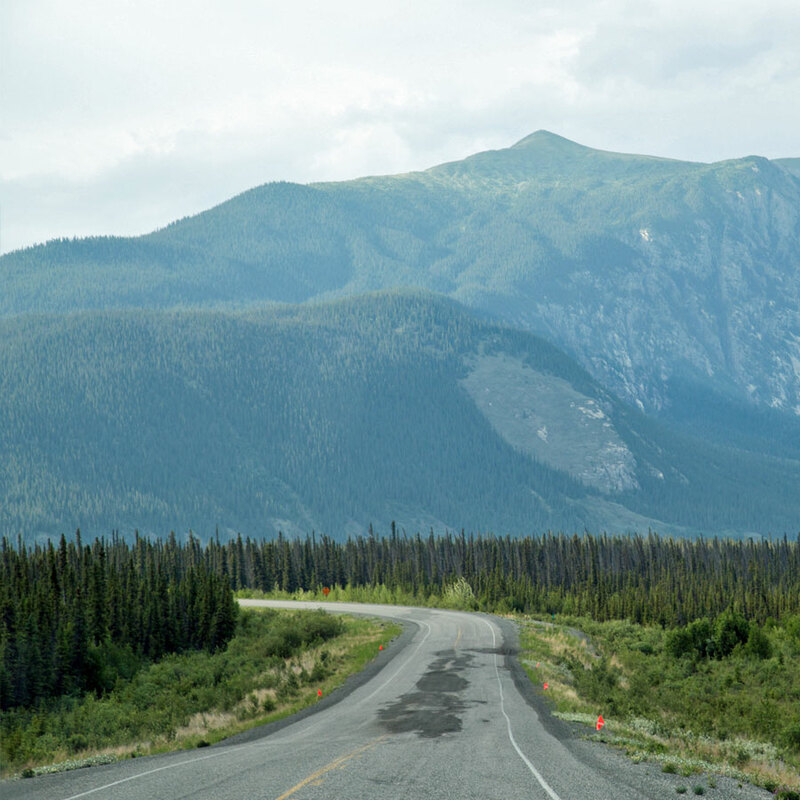 We continued along Highway 16, then turned onto the Stewart-Cassiar Highway, an off-the-beaten route to northern British Columbia. 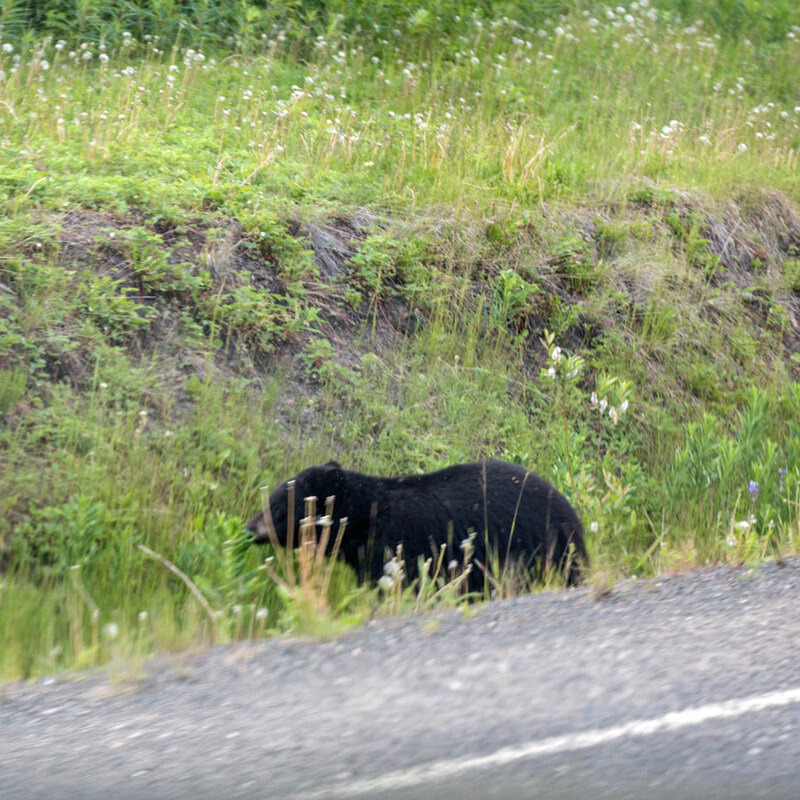 Not only were the snow-capped mountain views around every corner postcard-worthy, we saw five black bears that were just standing by the road. Yes, places to stop for fuel were relatively few and far between, but never to the point where we worried about running out of diesel. And the road quality was impressive, especially considering the remoteness of the drive. We had heard there were narrow wooden bridges that became slippery when wet, but the traffic was so sparse on the drive that these never posed a problem. We stopped for the night on a spacious highway pulloff near Kinaskan Lake. 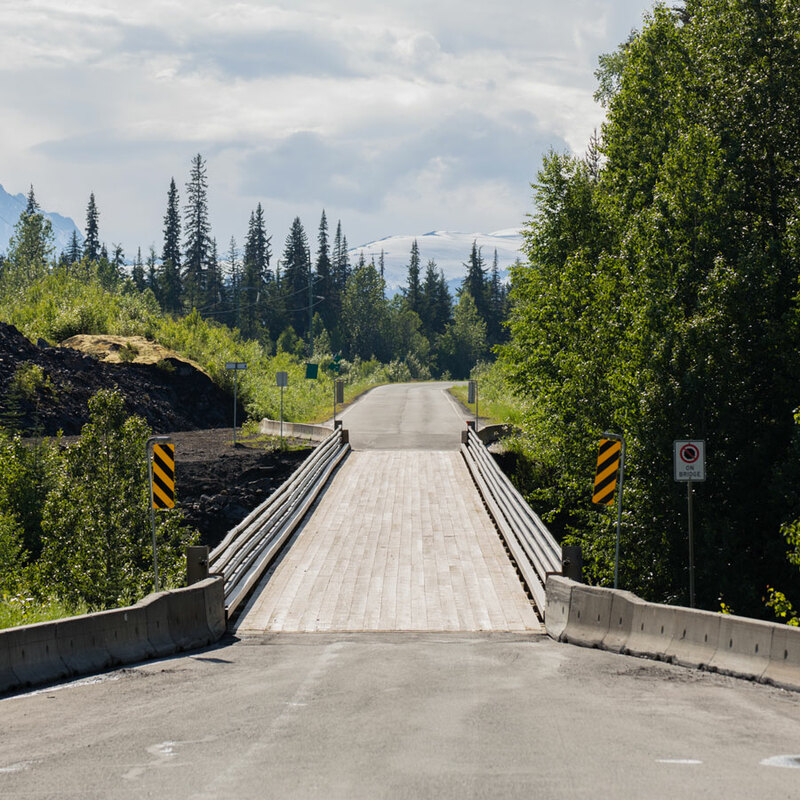 Our second day on the Cassiar Highway was not as easy as the first. 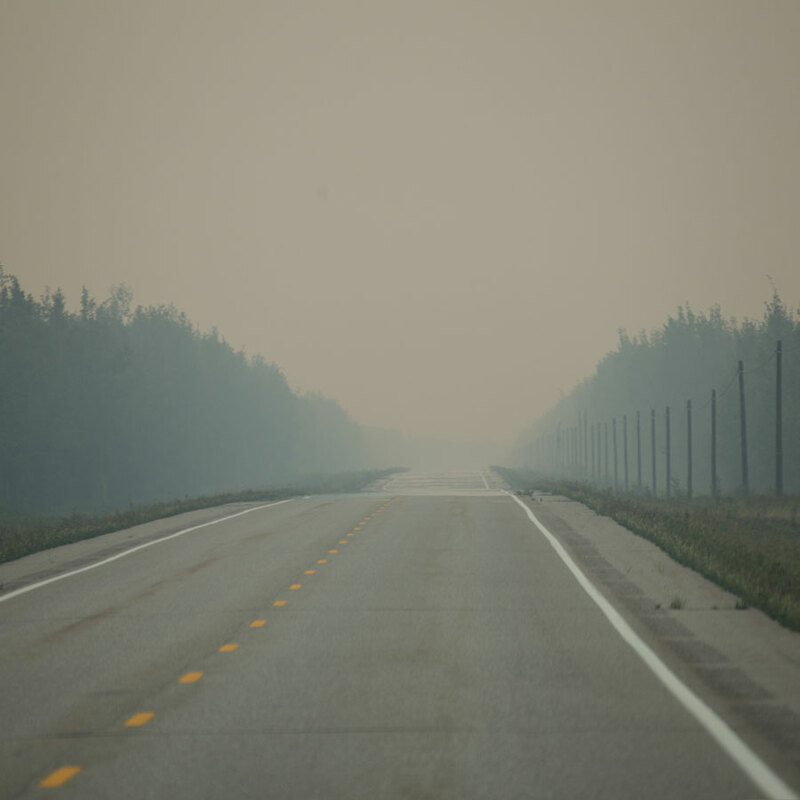 The road grew windier and bumpier, the animal sightings fewer (one black bear and one moose; we were spoiled at this point), and the mountains disappeared in our rear view mirrors. In addition, this is the day Josh started to come down with a cold that would plague him into Alaska. 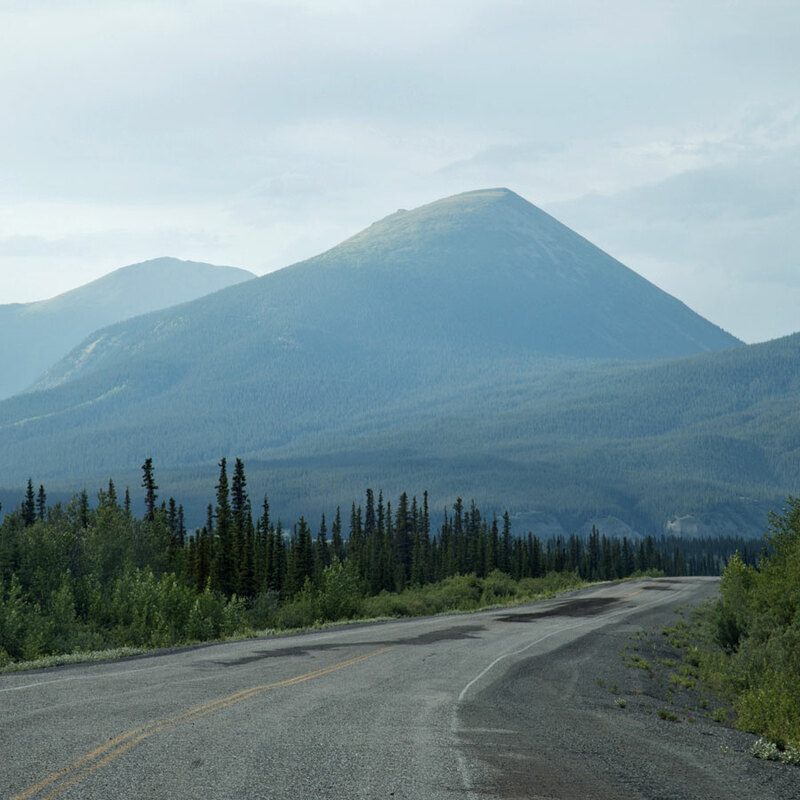 The moment we arrived in the Yukon, the road turned to gravel, giving us a bumpy ride to Junction 37, where we filled up our gas tanks again. 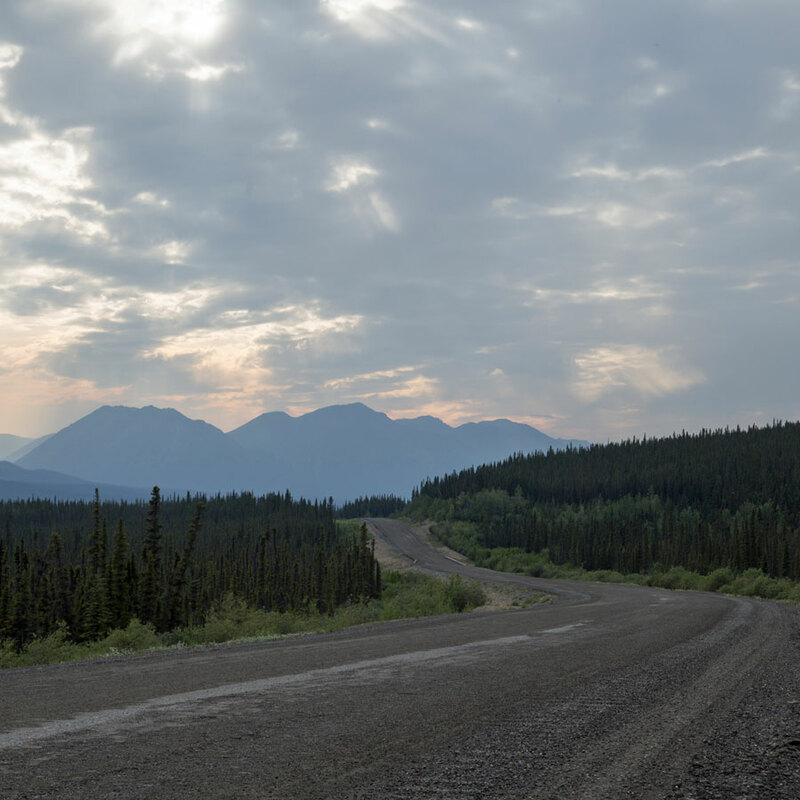 Here the Cassiar Highway meets the Alaska Highway, and the shortest route to Fairbanks is to turn west at this point, but we went a few miles out of our way to the east towards Watsons Lake. 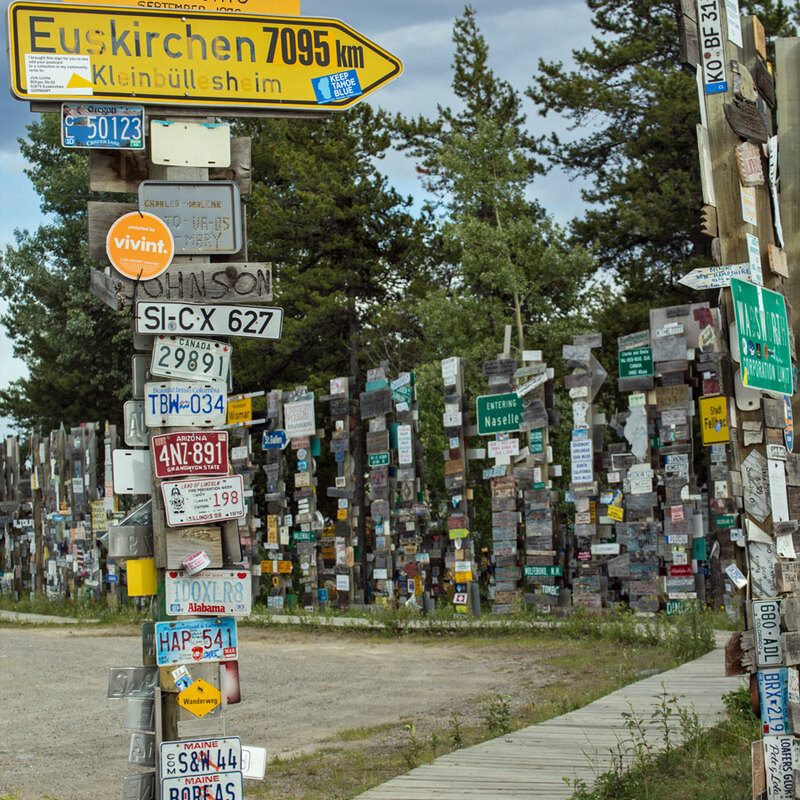 The visitor center is surrounded by rows and rows of signposts covered with signs from all over the world. 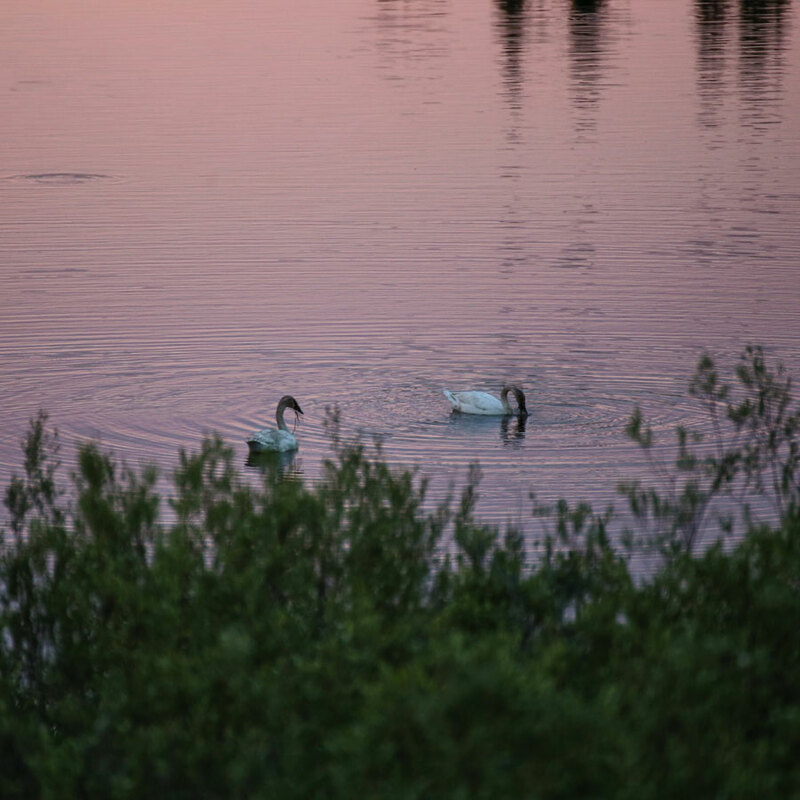 The story goes that, in 1942, Watsons Lake was no more than a military air base. Homesick Private Carl Lindley of the Army of Engineers added his hometown in Illinois to the base's directional sign, unknowingly starting a movement. Other soldiers added their signs, and then visitors the Watsons Lake did the same. Now it is known as the Signpost Forest. After leaving the visitor center, we spent the night boondocking at a government-managed campground just west of the city. The sites were mostly narrow, but we found one that was wide and deep enough to accommodate both us and the Banks' rigs. 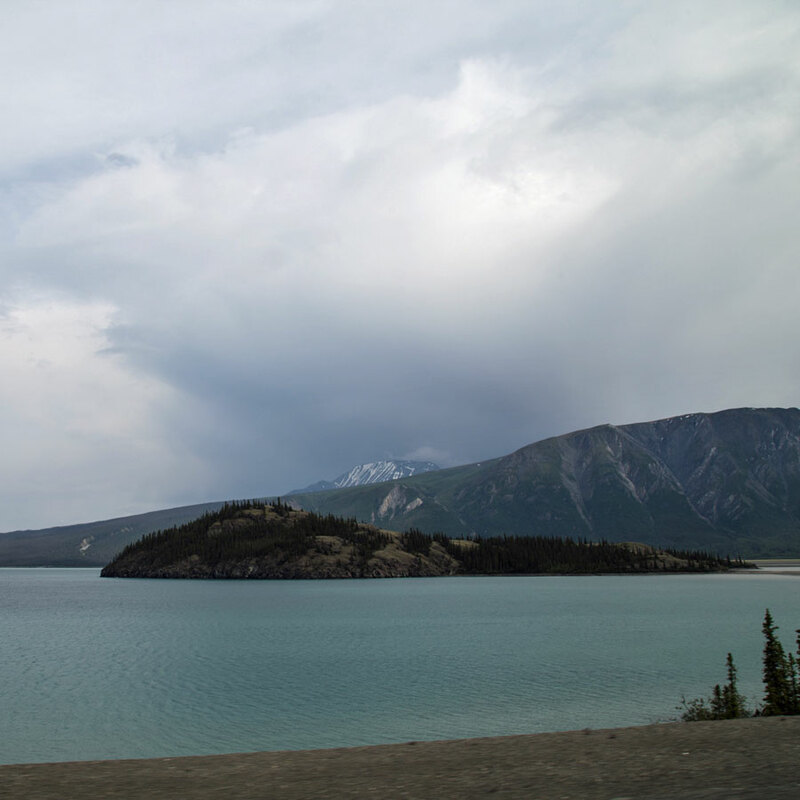 It was a quick and easy departure from Watsons Lake in the morning, and the drive along the Alaska Highway was a pleasant one. 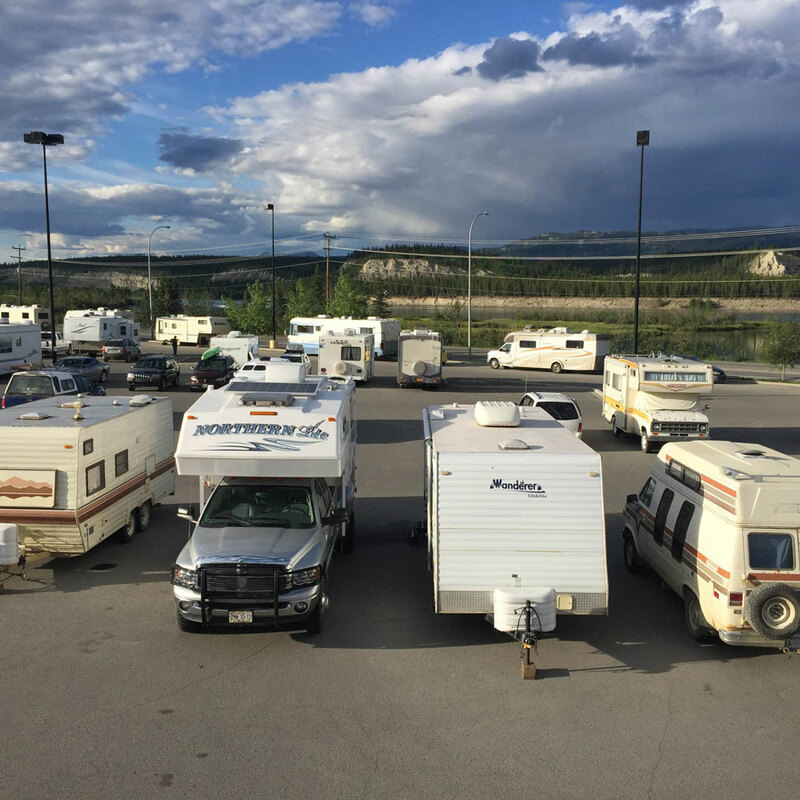 We had heard that the Walmart in Whitehorse was a great place to boondock, as we would be among other RVers, the free wifi from McDonalds was in range, and there was a dump station and water fill at the gas station in the corner of the parking lot. All of these details proved to be true, but the only one that was a true boon was the dump and water fill. The parking lot was home to dozens and dozens off RVs, many seeming to be there permanently, or at least seasonally. As a result the free wifi was completely overloaded, allowing us to just barely eke out one Facebook post. We also saw some questionable activity in the parking lot, making us reticent to leave our RV for long. 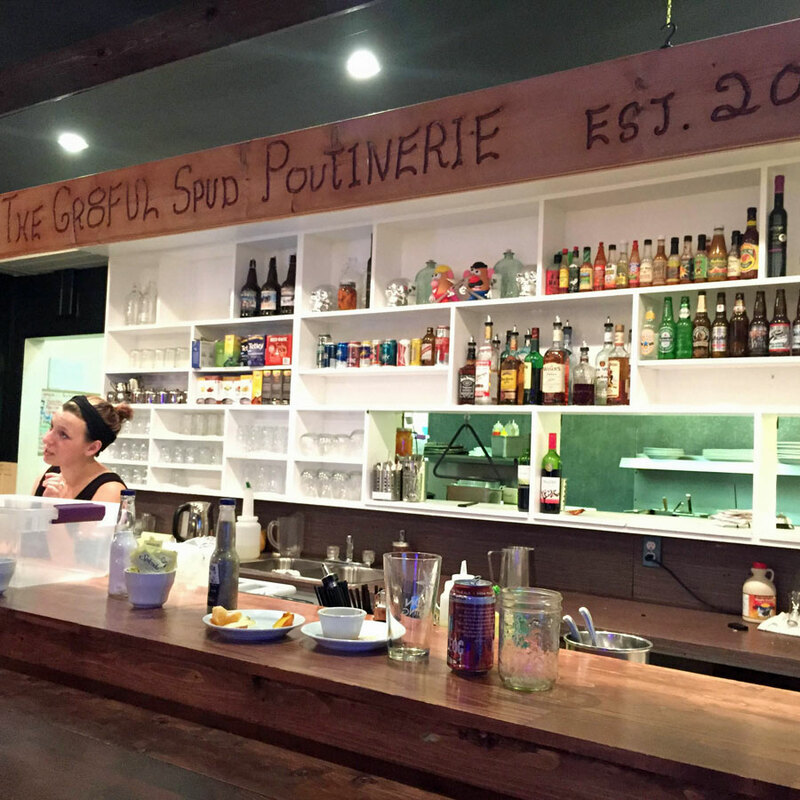 The evening was redeemend by an excellent dinner at The Gr8ful Spud, a quirky local place with delicious food, phenomenal wait staff and a fun playlist. This was the day we had been warned about: when we would be crossing over plenty of rough road that Taylor described as "bone-rattling washboard." Gravel patches kicked up endless amounts of mud and dirt onto and into our rigs, and frost heaves sent our 5th wheel and truck into contorsions worthy of a bucking bull. Can you see the frost heaves in the road? Despite all odds, this day also proved to be my second favorite of the drive. 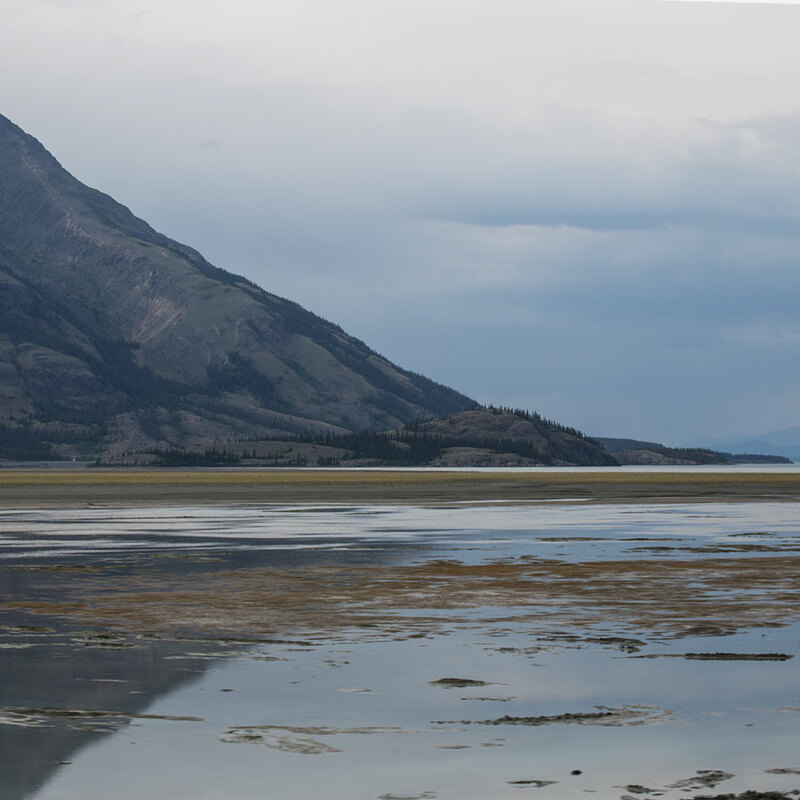 The looming Kluane mountains came into view. 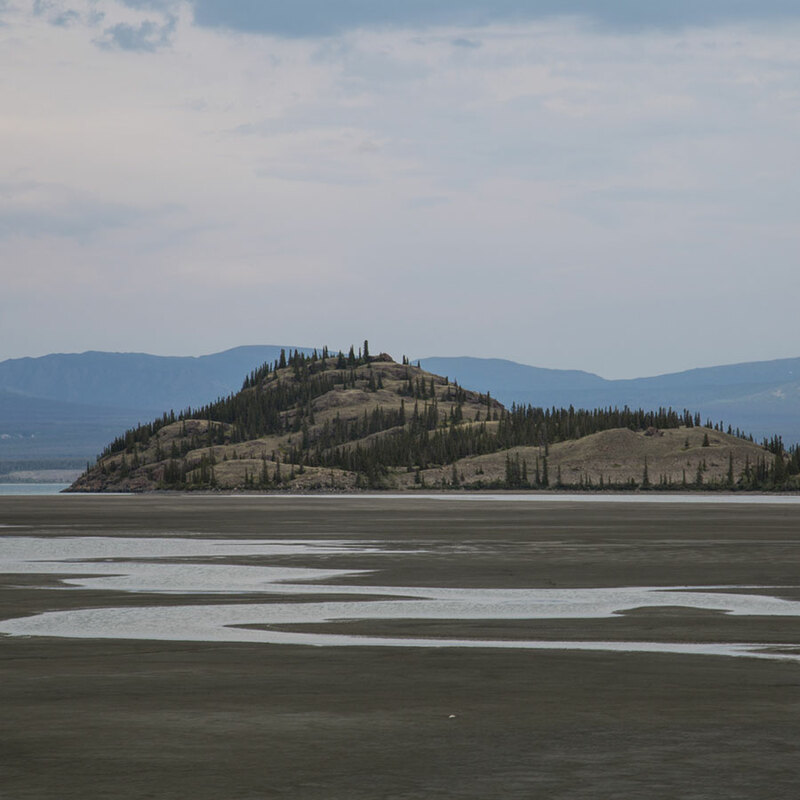 The range includes the tallest mountains in Canada and the most southern ice fields in the world. 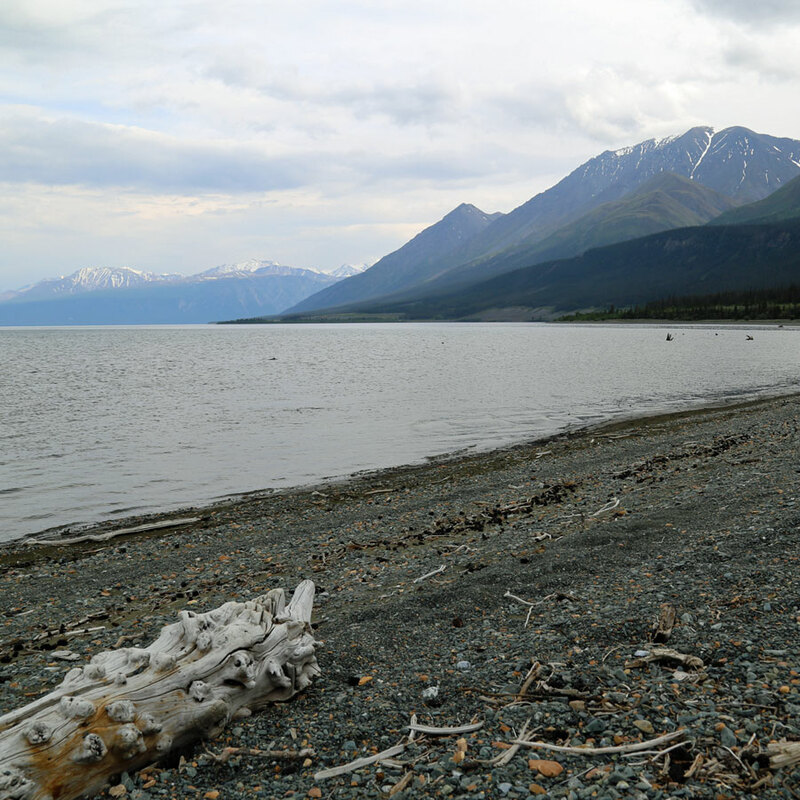 At their base was the spectacular Kluane Lake, the largest lake in the Yukon. We stopped for an uncharacteristically long photo break on its shores to take in the incredible scenery. 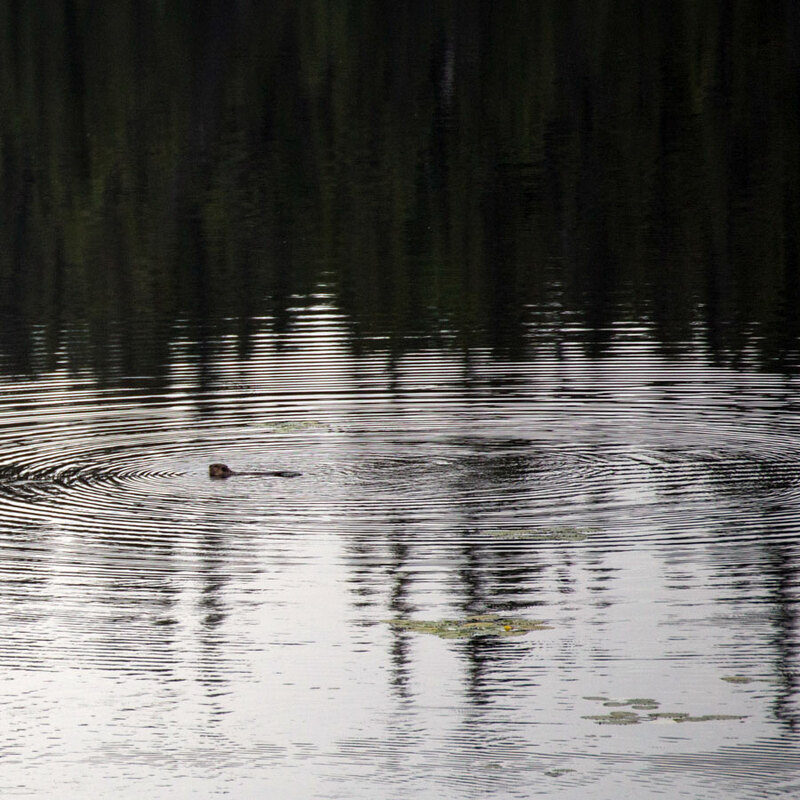 To top off the day, we saw innumerable bunnies, a beaver and one lumbering grizzly bear by the road. 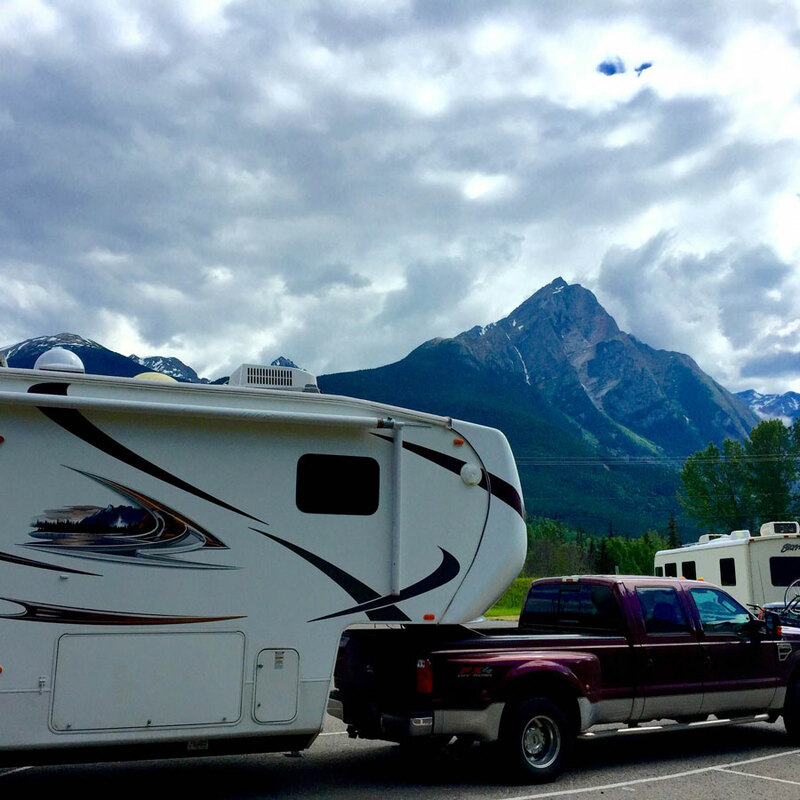 We had been planning on stopping for the night in Beaver Creek, just a few miles shy of the border, but when none of the RV parks or boondocking sites there looked promising, we found ourselves continuing on 30 miles to the Alcan Border. American customs is open 24 hours, so we rolled to a stop in front of the customs office at midnight to a brilliant sunset. 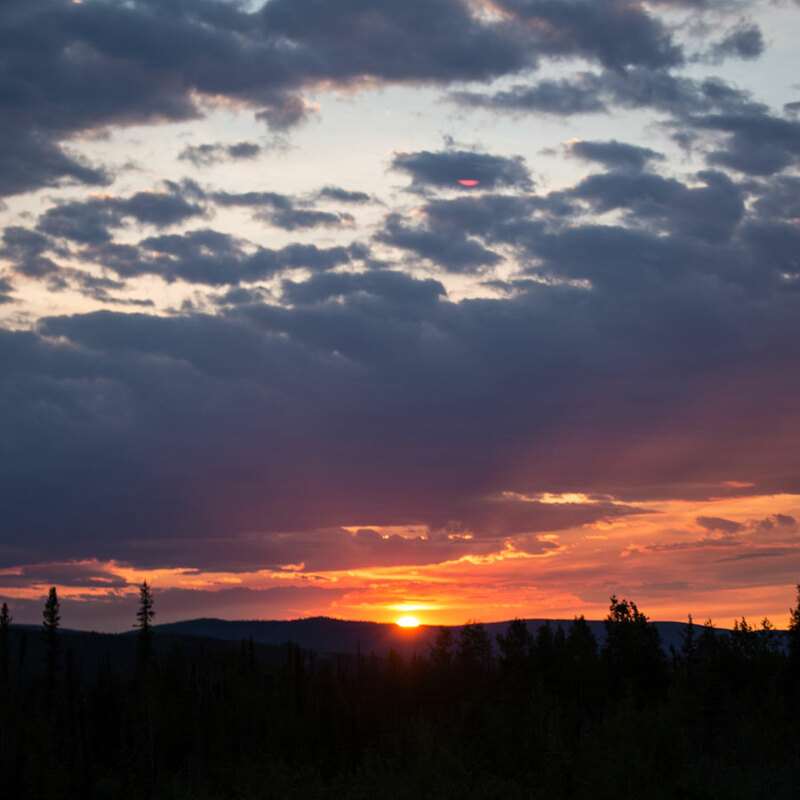 We had just confirmed it: the midnight sun was real! Reentering the USA was as easy as it had been to leave. We had no wait to speak with the customs officer. We answered a few questions, displayed our passport and were told to have a nice visit. The sunset just got nicer and nicer as we gained an hour in Alaska. 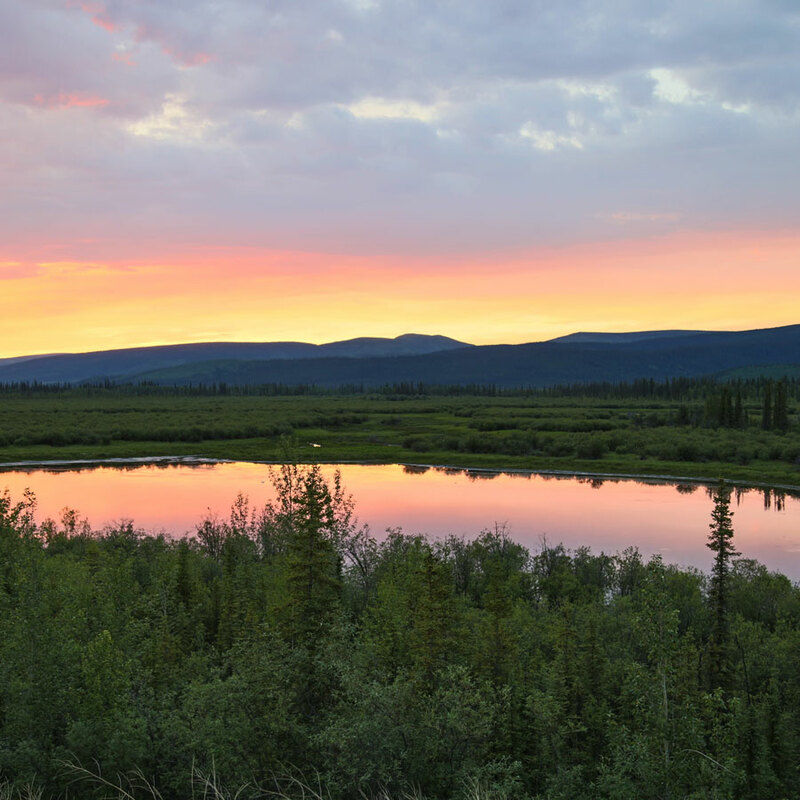 By the time we stopped at a highway pullout overlooking mountains, lakes and forests, it was midnight Alaska-time, and the sky was still bright. Despite the bright sky, we had no trouble falling asleep. 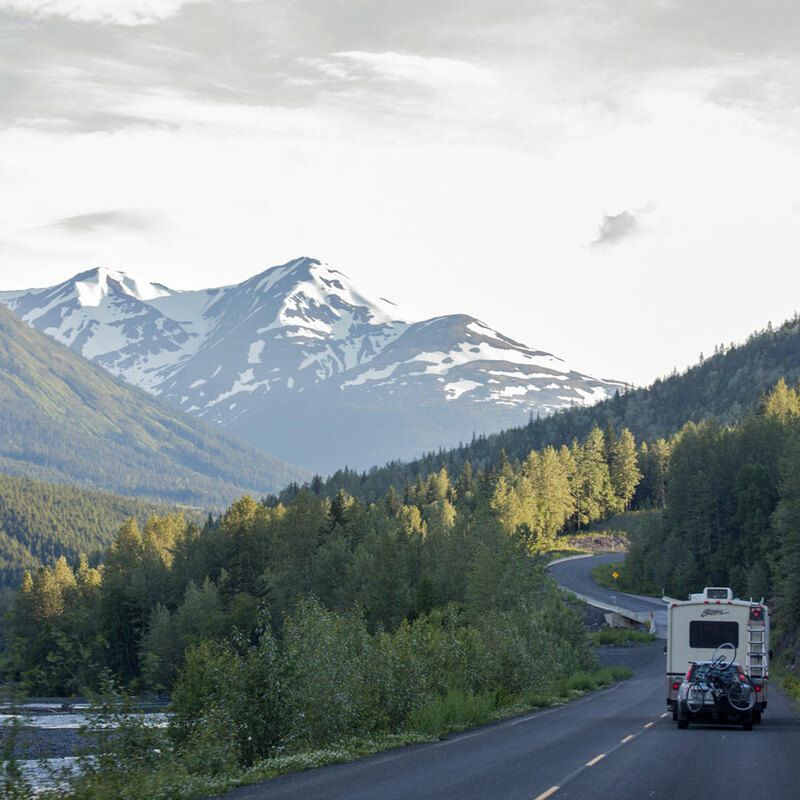 We were totally exhausted — and totally elated at having accomplished the major milestone of driving our RV to Alaska. 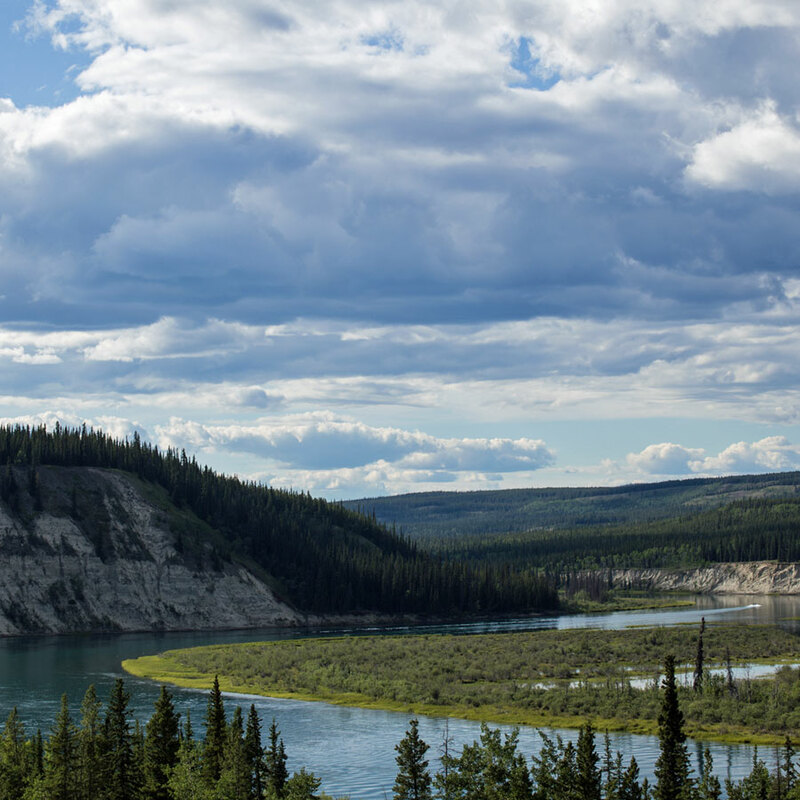 Although we had arrived in the state, we still had a full day's drive ahead of us to Fairbanks. Before we left the turnout, Josh and I took our truck to fill up the fuel tank. 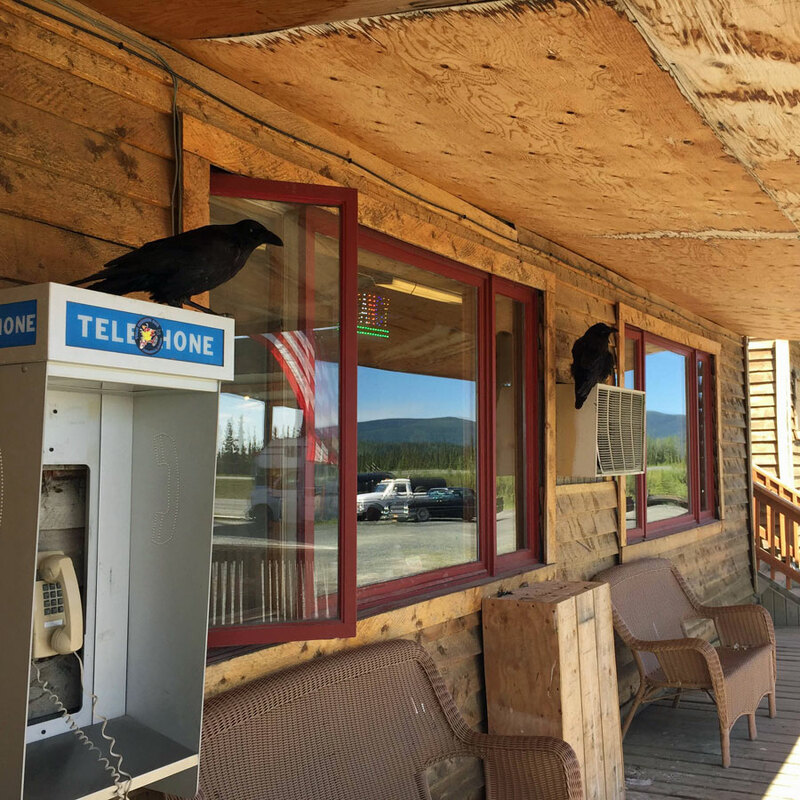 At the gas station, we encountered two skittish ravens who framed the window like guardians. 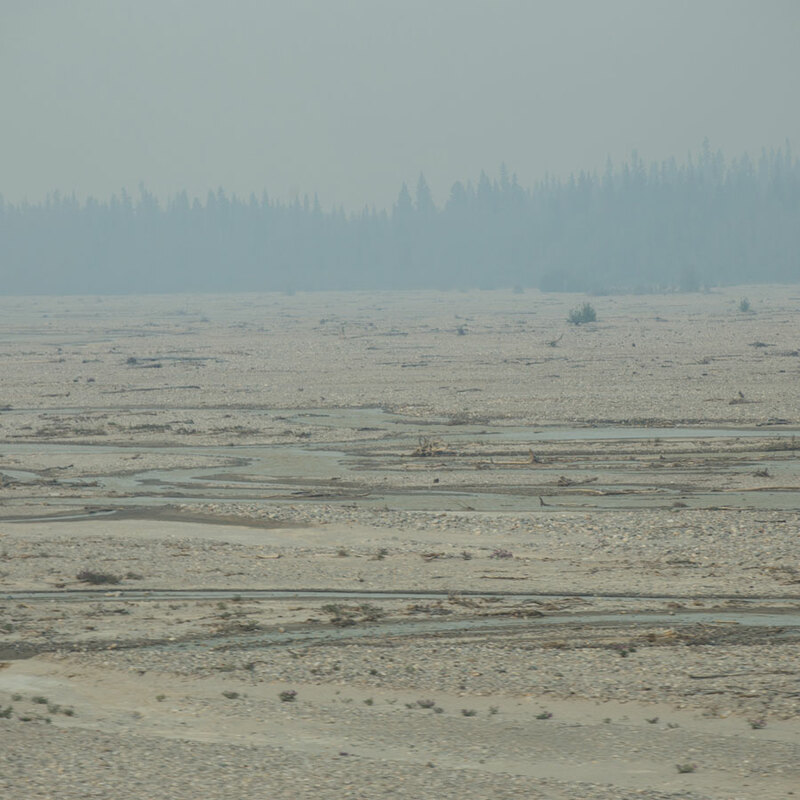 Perhaps it was an omen for spooky sights, because we drove through the smoke of a forest fire that blotted out the entire sky. 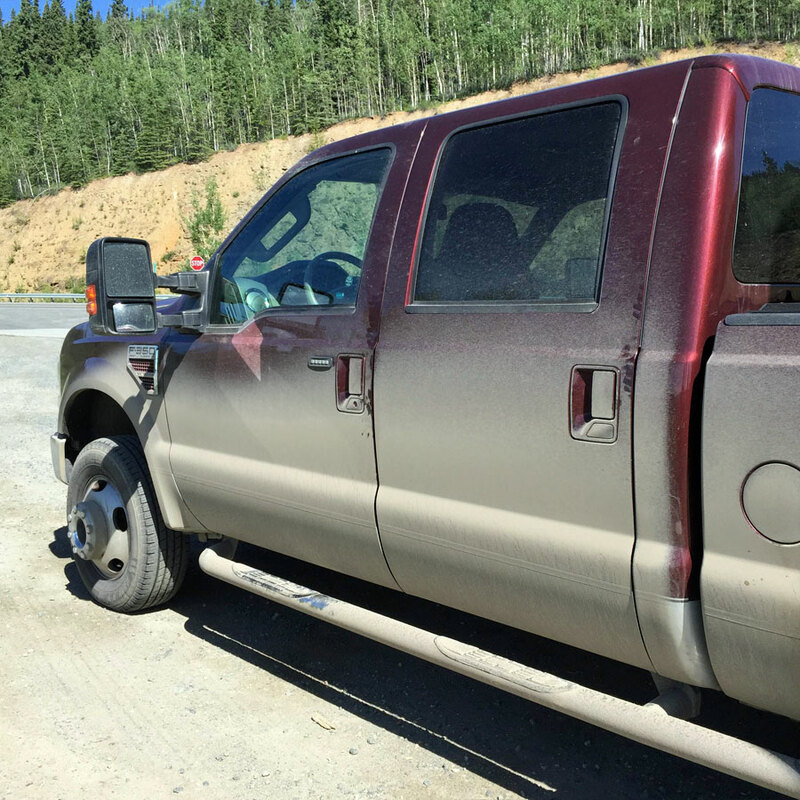 At Tok, we stopped to refuel, grab lunch and start the long process of cleaning our rigs. After one wash, we felt like we had barely made any progress. 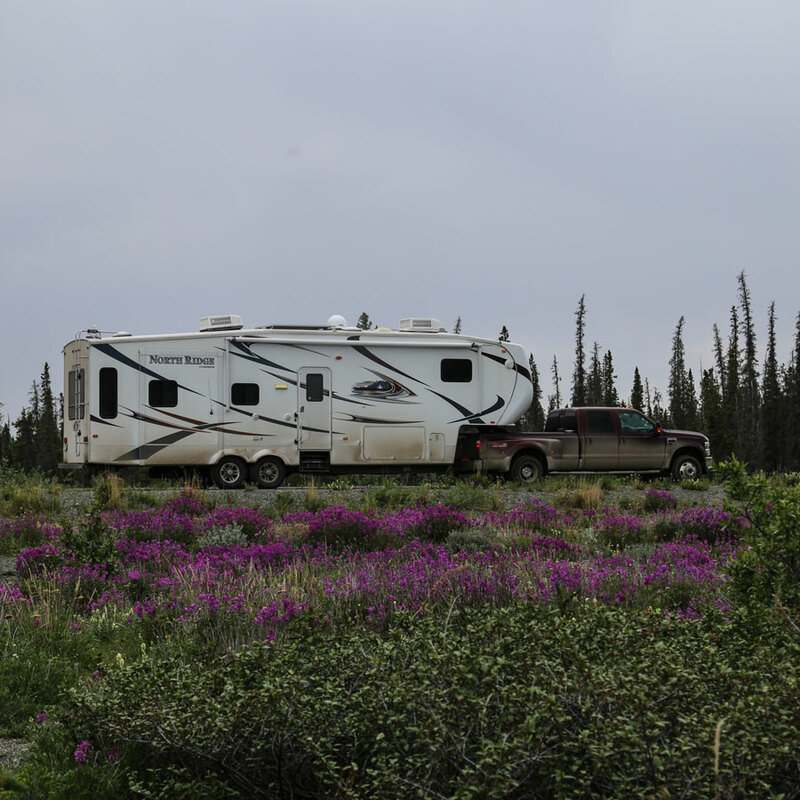 Despite some more frost heaves, potholes and gravel patches, we made it without incident to Fairbanks, were we pulled into the Pioneer Park lot, which provides shaded boondocking for $12/night with potable water on the premises. The fun is just beginning, and we can't wait to share more now that we're actually here! 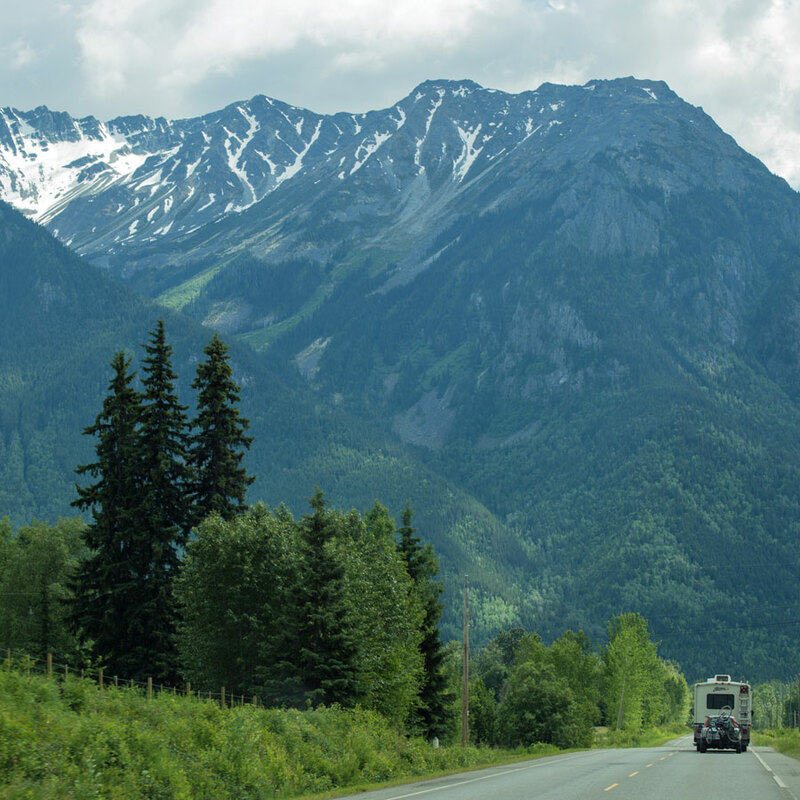 Have you driven from the Lower 48 to Alaska? What route did you take, and what were your favorite places along the way? We plan on taking more time on our return journey, so we'd love recommendations.